细胞特性：This is a hypertriploid human cell line. The modal chromosome number was 80, occurring in 42% of cells. Cells with 78 chromosomes also occurred at a high frequency. 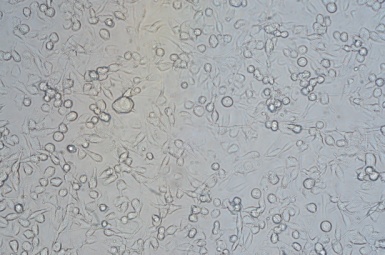 The rate of cells with higher ploidies was 2.5%. There were 30 or more marker chromosomes in each cell. They included der(1)t(1;?) (p32;? ), ?t(1p5p), i(3q), t(7q14q), ?t(2p3p) and others. The X and N3 had single copy per cell, and others were generally two to three copies per cell.